More than half of football fans in the UK have witnessed racist abuse while watching a football match, according to research published on Wednesday. In the largest recorded study of its kind, football's anti-discrimination campaign Kick It Out, and live-score app Forza Football surveyed 27,000 fans across 38 different countries on attitudes towards race inclusion in football. More than 1,600 respondents were from the UK, and 50.1 per cent of them claimed to have witnessed racist abuse at a game in the UK. Less than half of them said they would know how to report it (40 per cent). Globally, 54 per cent said they had witnessed racist abuse at a game, with only 28 per cent aware of how to appropriately report such incidents. A higher proportion of fans in Peru and Costa Rica (77 per cent) have witnessed racist abuse at football matches than in anywhere else in the world. The smallest proportion came from fans surveyed from the Netherlands (38 per cent) and Russia (41 per cent). Globally, more than three-fifths of respondents (60 per cent) said they would support points deductions for national or club teams whose fans are found guilty of racist abuse. And 74 per cent of fans want FIFA to consider previous racist abuse when awarding countries international tournaments. The hosts of the 2026 World Cup are in agreement, with 77 per cent of Americans wanting this, 76 per cent of Mexicans, and 77 per cent of Canadians. On a more positive note, 92 per cent of UK football fans said they felt comfortable with a player of a different ethnic or racial background representing their national or club team. Mesut Ozil retired from international duty after the 2018 World Cup, saying: "I am German when we win but I am an immigrant when we lose." But in Germany and Switzerland - where there were controversies this summer relating to abuse aimed at Mesut Ozil and players of Albanian heritage representing the Swiss national team - almost a quarter of fans (23 per cent) said they would feel uncomfortable with players of different ethnic or racial backgrounds representing their national or club teams. In the UK, 54 per cent of fans said they would support regulations to improve opportunities for ethnic minority candidates applying for jobs at football clubs. That compares to a figure of 64 per cent in the US where the Rooney Rule was implanted across the NFL in 2009. Lord Ouseley, chair of Kick It Out, said: "The research is a timely reminder of both the progress that has been made in tackling racism in football, and the challenges that remain. "There is a clear global trend towards an acceptance of the BAME community's central role in football, but further progress is unlikely to be made until governing bodies are bolder in their efforts to eradicate racism from every level. "The governing bodies, including The FA, UEFA and FIFA, must do more to promote methods of reporting racism and they must listen to supporters' demands - clubs or countries whose supporters are racially abusive should face harsher sanctions, including points deductions." Patrik Arnesson, founder and CEO of Forza Football, added: "This report shows a real appetite for meaningful change in footballing policy. "Organisations such as FIFA need to take note of the number of fans advocating points deductions for incidents of racism, for example. "Our data shows that the footballing world is modernising in relation to certain issues, but that there is also a long way to go." 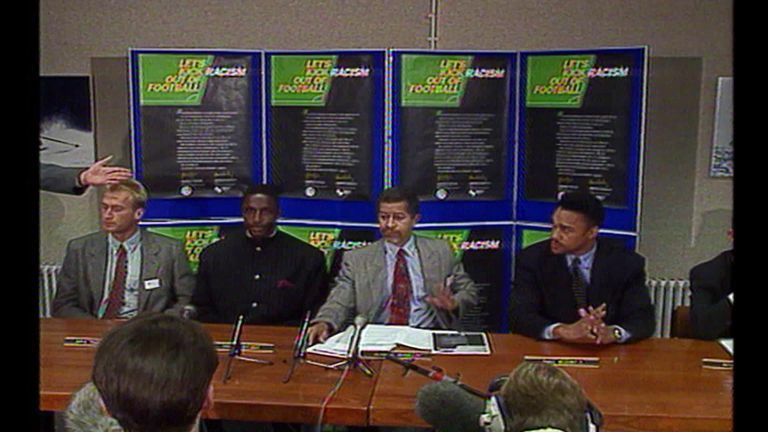 Take a look at our Sky News report from the 1993 launch of Kick It Out. The campaign celebrated its 25th anniversary earlier this year. Associate politics professors, Christopher Dawes (New York University) and Daniel Rubenson (Ryerson University), provided methodological advice on the study. They added: "This is a very impressive data collection effort and an important source of information on racial attitudes among football supporters. "The scale of the survey, certainly one of the biggest of its kind, makes it particularly useful for comparing these attitudes across countries and regions."